The Bergamot Featured in Rock Band. "A sound the indie world has been waiting for." 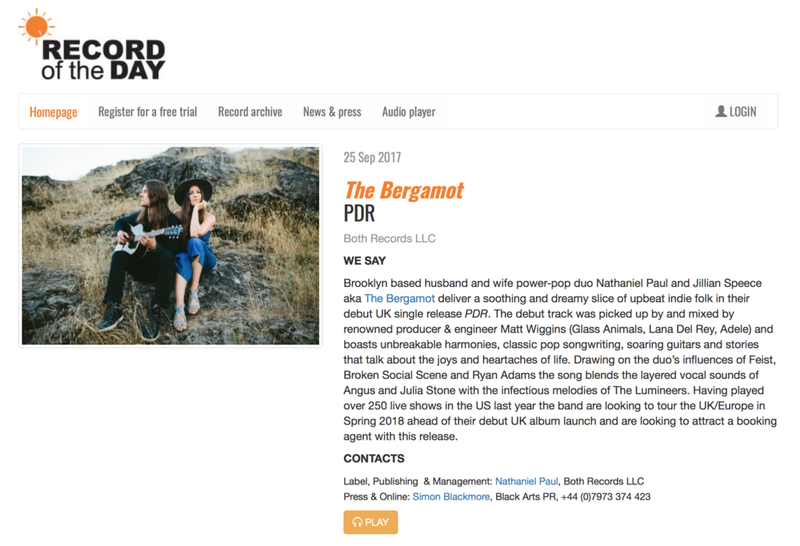 "Dreamy Pop New York Duo The Bergamot are about to turn the Indie scene on its head with the release of their new single [PDR]." A refreshing track filled with such beauty and warmth throughout." "Brooklyn based husband and wife power-pop duo Nathaniel Paul and Jillian Speece aka The Bergamot deliver a soothing and dreamy slice of upbeat indie folk in their debut UK single release PDR." The Bergamot is an American indie-folk-rock band based in Brooklyn, New York. The two founding members and songwriters of The Bergamot are husband and wife Nathaniel Hoff and Jillian Speece. The band formed in 2009 by lead guitarist/vocalist Nathaniel Hoff and lead vocalist Jillian Speece in college at Indiana University Purdue University Fort Wayne (IPFW). After college Hoff and Speece began touring America extensively sharing their positive music and vibes with their fans. In 2012 The Bergamot won the Bud Light Battle of the Bands and it helped them gain international notoriety. Through the years they have opened up for artists such as All American Rejects, Young The Giant and Wiz Kalifa. The duo has performed at SXSW, Taste of Chicago and Bud Lights Port Paradise Music Festival located in the Bahamas and they have graced the pages of People Music, Rock Band, BuzzFeed, Paste Magazine, Icon Magazine, The Daily Record (UK), The Daily Mirror (UK), The Chicago Tribune, Brooklyn Vegan, The Deli Mag, CMJ, Skope Magazine, Pancakes & Whisky, WGN Chicago, CBS, and HGTV. The Bergamot’s uplifting songs are powered by unbreakable harmonies with seamless songwriting adeptness that combines a story of both the joys and heartaches of life. In 2003, Jillian and Nathaniel met in high school in their hometown of South Bend, Indiana. Since then they have released five albums (Smile EP, Haven, Static Flowers, Tones, Young Again EP and have toured extensively performing over 500 dates in all 50 states their routes have included two tours to Europe. November 2017 they won Project Aloft Star via the (Aloft Hotel) Northern American competition. Drawing upon influences such as Pink Floyd, The Beatles, Joni Mitchell, The Dave Matthews Band Feist, and Ryan Adams. The Bergamot writes songs that are uplifting, catchy, and downright fun. Jillian’s velvety alto voice blends seamlessly with Nathaniel’s dreamy ethereal vocals creating dynamic harmonies that are apart of their signature sound. Speece and Hoff have an amazing gift for writing poignant songs based upon personal experiences with a relatable and emotional immediacy. They’re performances are high energy, infectious, and have turned first-time listeners into instant fans. The Bergamot bridges the gap between artist and audience by engaging them on a personal level though-out the performance. In 2016 The Bergamot released their highly anticipated new record TONES on February 11th. 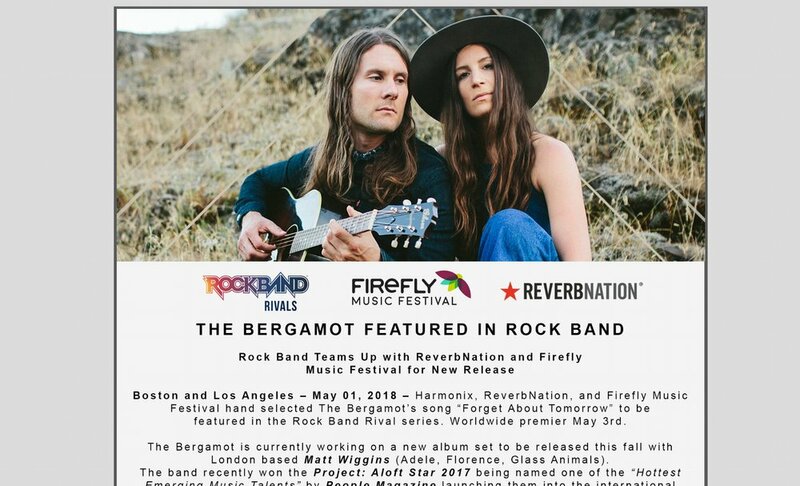 They are editing the The Unity Collective Documentary and just released their first ever live album called "The Bergamot Live at The Morris."